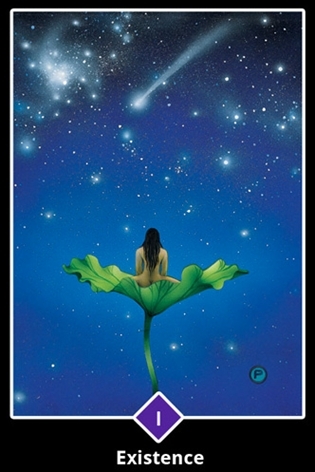 This naked figure sits on the lotus leaf of perfection, gazing at the beauty of the night sky. 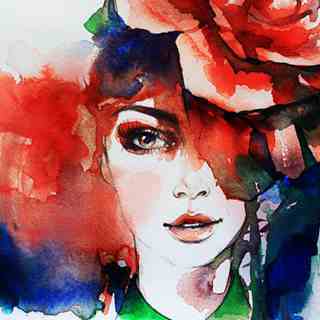 She knows that ""home"" is not a physical place in the outside world, but an inner quality of relaxation and acceptance. The stars, the rocks, the trees, the flowers, fish and birds--all are our brothers and sisters in this dance of life. We human beings tend to forget this, as we pursue our own private agendas and believe we must fight to get what we need. But ultimately, our sense of separateness is just an illusion, manufactured by the narrow preoccupations of the mind. Now is the time to look at whether you are allowing yourself to receive the extraordinary gift of feeling ""at ""home"" wherever you are. If you are, be sure to take time to savor it so it can deepen and remain with you. If on the other hand you've been feeling like the world is out to get you, it's time to take a break. Go outside tonight and look at the stars.